Ugor is an Orc ranger found in Largashbur, the Orc stronghold of the Rift. She was supposed to sleep from midnight to 8am, but doesn't due to an oversight (see bugs). Outside quest related events, she just hangs out inside Largashbur Longhouse. She wears steel armor with matching boots and gauntlets, and carries a steel sword and steel shield. Ugor: "Halt! You have no business here, outsider. Leave at once." Atub: "Ugor, no! This may be the one we need." Ugor: "We need nothing from outsiders! Yamarz will provide for us." Atub: "We cannot carry on this way! You know we are doomed if we do not do something!" Ugor: "Yamarz charged me with keeping outsiders away from Largashbur. You would have me disobey him?" Atub: "You were charged with keeping us inside the walls. Have faith, Ugor. I only wish the best for our tribe." Ugor: "Fine, it's your neck." If Ugor still lives after completing The Cursed Tribe, she would join as a follower should you ask. Although her default gear is governed by the Heavy Armor skill, Ugor is actually more proficient in light armor. Ugor's sleep package is overridden by her sandbox package, so she never sleeps. Ugor has a lower minimum level than the other Orcs at Largashbur. 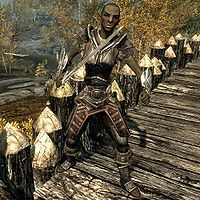 This issue has been addressed by version 1.2.5 of the Unofficial Skyrim Patch; minimum raised to 10. It is possible to find the corpses of Ugor and the other unnamed Orcs, unable to start the event that would unlock the gate, leaving you to find another way to enter Largashbur to talk to Atub. Jumping over the gate is allowed.